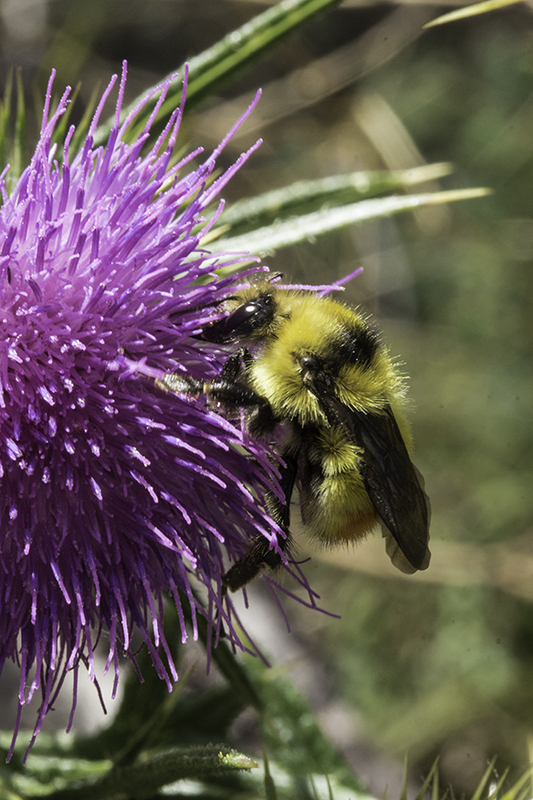 With support from the Friends of Bandelier, Dr. Olivia Carril began the first-ever native bee survey of Bandelier National Monument in 2017, with collections made near St. Peter's Dome, across Burnt Mesa, near Cerro Grande, and in Frijoles Canyon. All specimens have been labeled, and identifications are approximately half completed. Dr. Carril will continue identifications during the winter of 2018 and will resume collections in the spring and summer of 2018. So far, 483 specimens have been collected to date, and hint at an incredibly diverse fauna. Prior to the current study, only two species had been documented for Los Alamos County (a bumble bee, Bombus, and a sweat bee, Halictus ligatus). Over 46 species have been added to what is known for Los Alamos County from the current study, including at least three species of bumble bees (Bombus), leaf cutter bees (Megachile), resin bees (Anthidium), two genera of Cactus-specializing bees (Lithurgopsis and Diadasia), green metallic sweat bees (Agapostemon), and several sweat bees (Lasioglossum). Specimens from the genus Osmia were documented near Cerro Grande, and a unique, as yet unidentified small mining bee (Perdita) was found near the visitor's center in Frijoles Canyon. Plans for 2018 include the establishment of plots at Burnt Mesa, in the burned area of the Dome Wilderness on the west side of the monument, along the riparian area in Frijoles Canyon, and along the Alamo Boundary trail.